A recent report on the health of the ocean found that worldwide the marine vertebrate population declined by 49 per cent between 1970 and 2012 (see WWF/ZSL Living Blue Planet Report 2015). Globally, an estimated 300,000 small whales, dolphins and porpoises die each year from entanglement in fishing gear. Also in Europe, incidental catch is seen as the greatest threat to small cetaceans. However, the situation is much more complex than one might think. Bycatch is not a newly debated topic, but has received international attention for decades. Despite the obligations for monitoring and reducing bycatch under the EU Habitats Directive, sufficient data are still missing. Monitoring schemes are poor and most reporting depends on the goodwill of fishermen. Official figures are clearly an underestimate, because many more carcasses of stranded animals show evidence of being victims of bycatch. 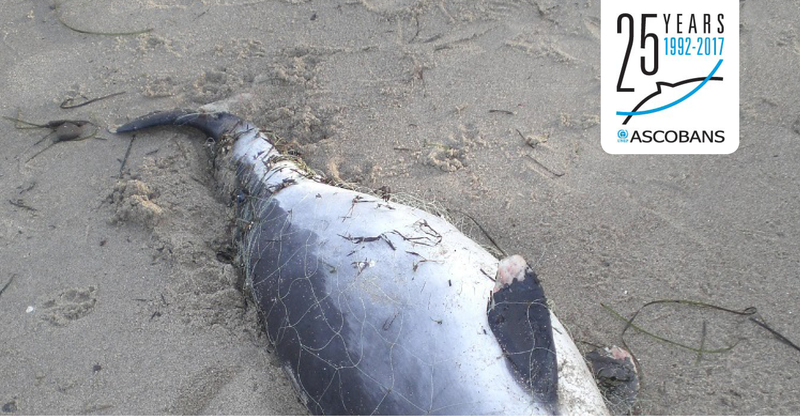 Since they occur in inshore waters and tend to feed on the seabed, harbour porpoises are especially vulnerable to bycatch in set net fisheries, in particular trammel nets and set gillnets. The Baltic harbour porpoise population is especially at risk with only about 500 individuals left (see the second article in the series: Saving the Harbour Porpoise in the Baltic Sea). The ASCOBANS Jastarnia Plan recommends pingers (acoustic deterrent devices) only as a short-term solution to buy time for the development of alternative fishing gear less harmful for small cetaceans. However, such gear needs to be commercially viable so that fishermen can continue to make a living. Other research focuses on developing alerting devices, or on risk assessments to allow targeted time-area closures for specific fisheries. As early as 1997, ASCOBANS passed a resolution which set the aim “to restore and/or maintain biological or management units to/at 80 per cent or more of the carrying capacity”. In the following years, much work focused on advising on how to reach this aim. For harbour porpoises, this led to the recommendation that all human-induced mortality combined, such as from bycatch, vessel strikes or pollution, had to be kept at below 1.7 per cent of the best available population estimate. If the rate is higher, the population will not be able to sustain itself. Yet the general aim still is to reduce all anthropogenic mortality to zero (see MOP8 Resolution 5 adopted in 2016). Much still needs to be done to reach that aim. A workshop taking place later this month is therefore looking further into this matter, trying to move forward the bycatch-related work in Europe over the next few years. In addition to guiding the Parties in tackling the bycatch problem, ASCOBANS also provides advice to the EU, which has the legislative competency with regard to fisheries in Europe. For example, in 2015 ASCOBANS Parties sent their recommendations to the Commission on how to improve the legislation relating to bycatch monitoring and mitigation, currently set out in the widely criticised Regulation (EC) 812/2004. Many issues relating to the bycatch problem are being discussed in the realms of scientists and governments. But each and every one of us can make a difference. For example, when buying fish and other seafood, find out which fishing techniques are used and which products really are “dolphin friendly”. That way you can make an informed decision when grocery shopping. Check with national NGOs which labels to trust and which choices are the most responsible. This year marks the 25th anniversary of the opening for signature of the Agreement on the Conservation of Small Cetaceans of the Baltic and North Seas (ASCOBANS) in New York on 17 March 1992. Over the past 25 years, ASCOBANS has provided the framework for international cooperation for the protection of small cetaceans – whales, dolphins and porpoises – in northern and western European waters. This is the third of 25 stories emphasizing milestones and special achievements of ASCOBANS throughout the year of its silver anniversary.